I love oats! They are one of my favorite whole grains. I blend gluten free whole oats in my food processor until they are flour consistency. 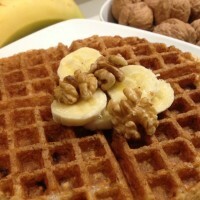 The flour is so light and airy in waffles that it feels like I’m eating a refined dessert. Instead I’m getting all the benefits of vitamins, minerals, fiber and phytochemicals found in whole grains. Whole grains are associated with longevity and a lower risk of heart disease and several types of cancer. Instead of following the latest fad diet, choose to include whole grains and give ancient grains a try too! Mash a banana on a plate, then mix into wet ingredients. Pour wet ingredients into dry ingredients and whisk until bubbly. Want to experiment with oats a bit more. Try my Best Ever Gluten Free Zucchini Muffins.